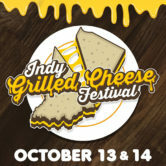 The Indy Grilled Cheese Festival is a two-day event showing off your favorite childhood food – Grilled Cheese! The Saturday festival is open to guests 21 years and older. The Sunday festival is open to all ages. Both days will feature live music, cold drinks, games, bars and all of the grilled cheese you can eat! Eating contests your thing? Well, you’re in luck! There will be a Grilled Cheese eating contest at during the event. More details coming soon! Cast your vote and help us decide who has the Best Grilled Cheese in Indy! Guests can choose between two dates! Ages 5 and under get in for free! No ticket needed. Do I get unlimited grilled cheese sandwiches? No, each ticket comes with a set amount of grilled cheese sandwich samples. Attendees can purchase additional sample tickets at the event’s ticket booth. Parking is available on city streets and inside city parking structures as well. For parking garage options Click Here. There are no refunds for tickets bought to the Indy Grilled Cheese Festival . Yes! At Sunday’s all-ages festival there will be a free kids zone available. The kids zone will include inflatables, face painting, and more! All attendees of must be at least 21 years old to attend the Saturday event. All ages are available for Sunday’s festival. IDs will be checked upon entrance at the gate where tickets are scanned. Organizers reserve the right to refuse service to anyone for any reason. There WILL be lines: We are doing everything we can to minimize them, but if you want fresh and hot grilled cheese sandwiches, there will be lines. Come prepared to listen to great music, divide and conquer the lines with family and friends, and enjoy the day outside! If there’s a vendor with a shorter line, try them out! All vendors have great sandwiches. Don’t sit in a long line just because it’s long!